This activity is so named because it’s supposed to simulate the manipulation of radioactive graphite discs in an atomic pile. Like all good team building challenges, it requires concentration, cooperation, and strict attention to the Scout who’s calling the signals. The object of the challenge is to place and balance the log on top of wooden “cookies” (discs). The log is maneuvered by pulling in or paying out line from four ropes, each of which are threaded through a pulley and controlled by an individual Scout. The discs can vary in height, color, position or can be numbered, all to correspond with how many points they’re worth. 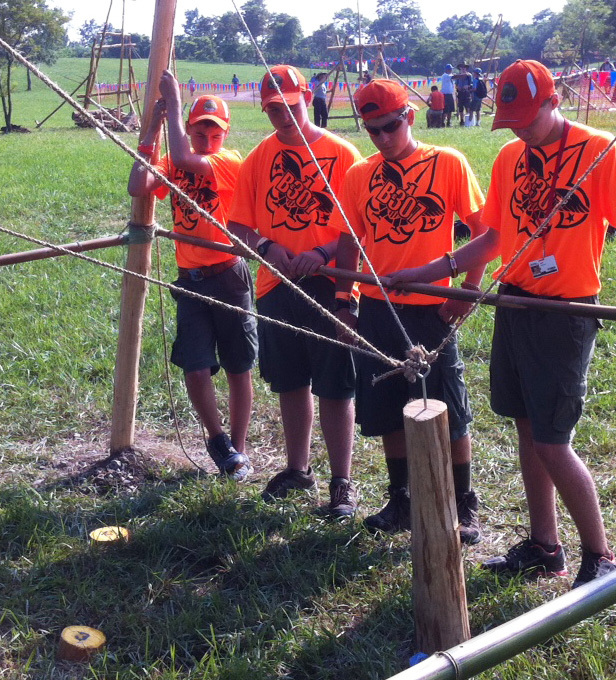 An additional test of skill can be introduced by challenging the Scouts handling the ropes to turn around so their backs are facing the log. In this way, they can’t see the position of the log and placement of the wooden “cookies,” and hence must rely only on the verbal commands of the signal caller. It is also interesting to take the natural leader out of his or her role and let the team solve the problem with their own abilities. Ask the leader to take a smaller part and not direct actions. If the group has been practicing group leadership the results will show in this activity. With or without their leader the group should still be able to succeed. If they fail, they learn what is needed and try again. In other words, they learn by doing. Hi Tom! Your input is and always will be very much appreciated! In team building, group leadership is referred to as the team “pooling its resources,” and as you say, this activity affords a golden opportunity to do just that.